So my plan for May is to do a post of some sort everyday. Something i really hope i can do, as not only will it keep me busy, but i think it'll be good for my blog to be bombarded with a variety of different posts! So here's a wishlist to kick things off! 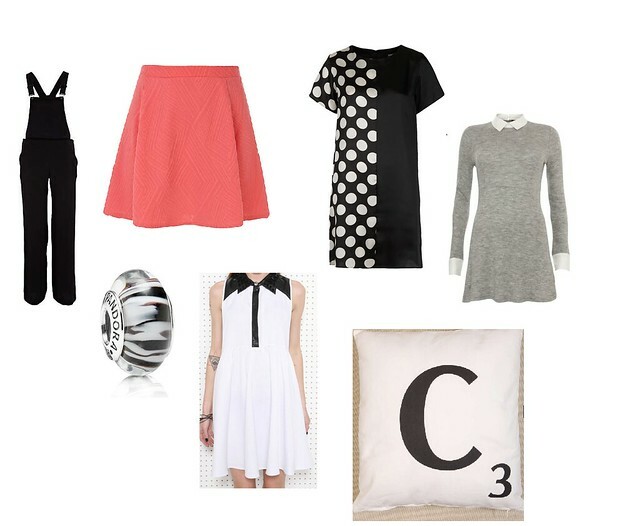 I'm a lover of all things monochrome, so the black collared dress and the spot mix dress are items i definitely need, i can't help my love for the combo of black & white! I've seen many people on the blogsphere wearing dungaree and if i can get over my fear of wearing trousers i think i may have to invest in a trusty pair myself, they are so stylish and wearable with nearly anything, it'd be a shame not to have a pair. I have a collection of cushions on my bed and i think the scrabble cushion would be a nice addition. The zebra print Pandora charm represents having a rare medical condition, and considering i'm suffering from one, i think the charm is needed! Oh the skirt is so pretty! fun pillows are a great way to add oomph to a room. too cute!